Our poor hands have to put up with a lot so it's important to take care of them. Everyday encounters like the weather and cleaning products can speed up the effects of aging on your skin and leave your hands looking dull and feeling uncomfortable. 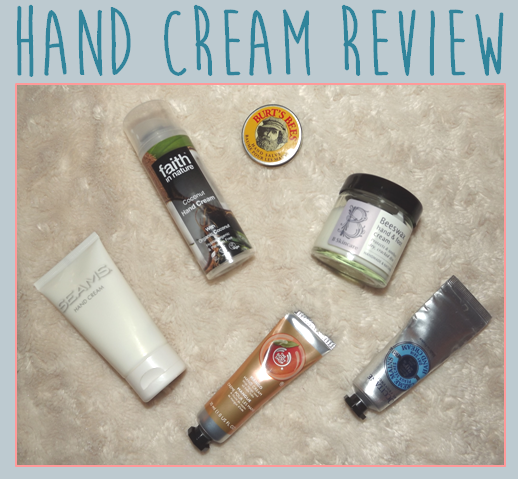 I can't stand having dry hands so I always have an abundance of hand creams available to use. Here's a review of the creams I've been using at the moment. B Skincare is a fantastic company, based in Cornwall, that produces handmade, natural products (which are cruelty free!). I'm going to be doing a blog post based entirely on B Skincare as I have quite a selection of gorgeous products that I have adored using this winter, so definitely look out for that post! 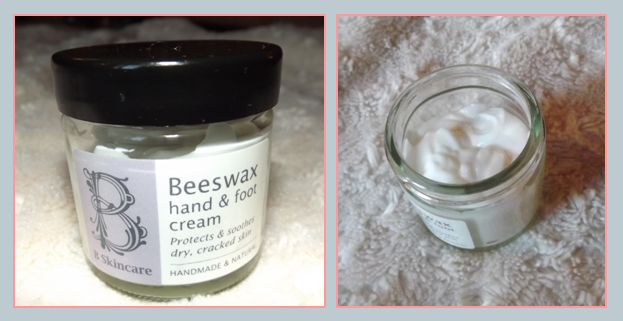 This Beeswax hand & foot cream is their original, best-selling cream. It is designed to be heavy-duty and nourishing, so I use it at night to give it plenty of time to have it's full effect! I like to apply it liberally to my hands and feet (which I then cover with socks to prevent losing any product) before I get in bed. It's slightly thicker than most hand creams - which makes it perfect for the dual use of a foot cream as well as a hand cream - but is absorbed easily into your skin, so is ideal for any daily routine. It really isn't oily or greasy either - which is a pet peeve for me with hand creams! In terms of fragrance, the website describes it as having the scent of the Ylang Ylang essential oil. The smell is subtle, but the perfumed nature to it is really pleasant. I am massively impressed by the formula of this cream - it really is so nourishing and every morning my hands feel so soft and supple. I'd particularly recommend this if you use your hands a lot for your work or if you work outside because it is really soothing for damaged skin. It also looks and feels like a luxury product - it comes in a gorgeous glass pot that looks so much prettier than the conventional hand cream tubes! A couple of months ago was the first time that I'd sampled The Body Shop's Mango range when I was shopping for presents for my Mum. She loves the mango body butter and when I smelt it myself I decided I had to have something in the same range to call my own! The scent is so sweet and so enticing that it's a pleasure to use. The fruity nature is really refreshing as well. I'd never actually tried one of their hand creams before and because I'd bought this solely for the smell, I really wasn't sure what to expect. I have to say, I was pleasantly surprised! Not only does the scent maintain on your skin for a good amount of time, the product itself sinks into your skin in good time without leaving a greasy feel. It's definitely more of a daytime moisturiser for when you're on the go and the tube makes it convenient to store in your handbag. 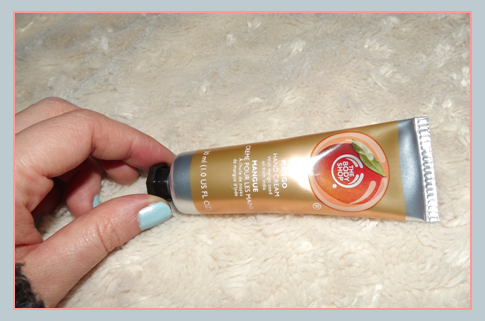 The packaging itself, like all Body Shop products, is adorable - I love the light orange colour and the easy access nature of the cream - and, in terms of the price, £3.50 is great for a daytime hand cream. 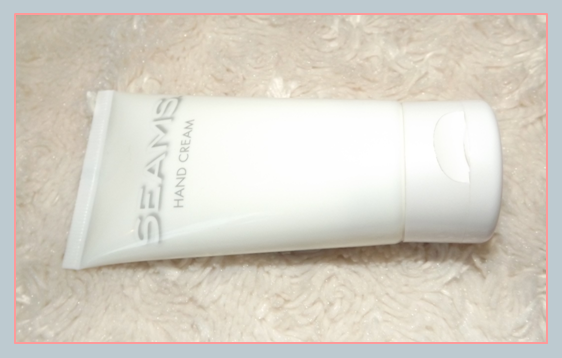 Seams Beauty is a relatively new company that have launched a great hand cream that you may have seen mentioned in Bazaar. The packaging, as you can see, is plain and simple - no nonsense. The bright white nature means it's easy to find in your bag! MEND, MOISTURISE, SOFTEN, SOOTHE and PROTECT hands. FADE agespots, STRENGTHEN nails, CONDITION cuticles. NON-GREASY formulation instantly absorbs. MADE IN UK. One thing I do want to point out that does set this cream apart from other day-time hand creams is the effects it has on your nails. I genuinely do believe this hand cream has been making my nails themselves a lot healthier and has helped to mend the broken skin around my nails which is so vulnerable to drying out in the winter. 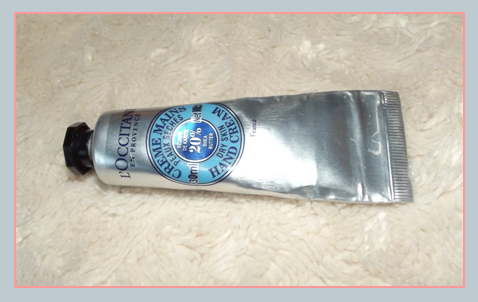 The consistency of the cream is slightly thicker than other tubes of cream that I have (like The Body Shop and L'Occitane creams) so it takes a little bit longer to soak in, but equally its effects last so much longer than these high-street products. The ingredients include Fragonia Oil, Shea Butter and Macadamia Nut Oil - which all are perfect for a hand cream considering their moisturising and soothing properties. The smell is quite unique to the cream, but does have a subtle fragrance. I would definitely suggest having a look on their site to learn a little bit more about this product because I think we can expect big things from this brand! It's already a huge favourite with designers, make up artists and crafters - so it has a lot to offer! If you've been reading my blog then you'll notice that this is the second time that I've mentioned this hand cream in a blog post! 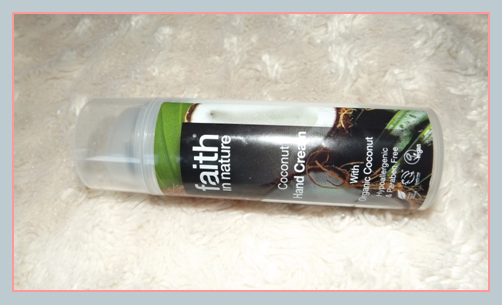 I actually reviewed this product in a post dedicated entirely to the Faith in Nature company (you can find it: here), but it is such a great hand cream that it deserves a second mention. This cream is a household favourite at the moment, not only because of it's beautiful scent, but also because of the no-mess packaging (a quick and easy pump system) and the light, easily-absorbed nature of the formula itself. For a longer description, take a look at the afore-mentioned post. This product has been featured in so many different magazines that I decided I just had to try it! I'd never used L'Occitane products before (purely because I couldn't afford them), so I was really excited to give this a whirl. As you might be able to see from the picture, this product is well used as I've kept it in my lecture-bag at uni. It's a lovely, smooth, light hand cream which is ideal for use during the day, but isn't massively long-lasting. I do find myself having to re-apply it quite regularly. The scent is also surprisingly neutral, so if you like a fragranced cream I wouldn't go with this one. I have to admit, I was so attracted to this cute little tin that the packaging massively swayed my purchase choice here! Sadly, I'm really not sure the tin idea really works for hand care. It's quite fiddly to open the tin and you have to keep going back in to the tin to get enough product to cover all of your hands. In terms of the formula, the salve feels fantastic on your skin. but it is more greasy than the other products I've reviewed so far. I would recommend it for your nails and cuticles though! It smells quite strongly of fresh lavender in the tin, but the smell it a lot more subtle on your skin. Just to finish this post off, I'd say that my favourite night-time hand cream is easily the B Skincare cream and my favourite day-time hand cream is a toss up between the Faith in Nature Coconut Cream and Seams. My December Beauty Favourites Video! Glo & Ray - My favourite eye and lip products! My first four W7 products!